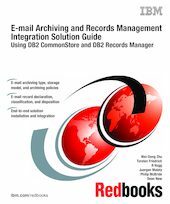 As more companies need to manage their e-mail to support regulatory compliance, litigation, and corporate policy and to improve system performance and productivity, the e-mail archiving and records management solution presented in this IBM Redbooks publication is here to rescue. We describe the products’ roles in the solution and introduce the basic concepts behind e-mail archiving and e-mail records enabling. We cover features and functions of CommonStore, Records Manager, and Records Enabler, and address key areas to understand and consider when planning and designing each piece of the solution and the overall integrated solution. In addition, we discuss different system configurations, implementation paths, security, the end-to-end solution installation and configuration, and some advanced topics such as records disposition and discovery. This book is intended for IT architects and specialists who will be responsible in planning, designing, and implementing an e-mail archiving and records management solution.